As the weather warms up, you begin lacing up your sneakers, and your body begins itching to hit the pavement for a leisurely jog or a training run this spring, take a minute to read on. Poor preparation, excessive increases in mileage, and running on those rolling hills can increase your risk for developing heel pain, otherwise known as Achilles tendinopathy. Now if you’re not a runner, never thought of jogging a day in your life, don’t sign off just yet. Manual laborers, nurses, weekend warriors, or anyone required to spend the majority of their day on their feet are not off the hook. Achilles tendinopathy is an overuse injury, meaning all of us who work hard, train hard, or play hard without the appropriate preparation may be at risk. The word tendinopathy describes a disorder at the tendon, or where your muscle attaches to your bone. While this disorder can happen at any number of tendons in your body, it happens most frequently at the connection between your gastrocnemius and soleus ( calf muscles) to your calcaneus or heel. And as with many diagnoses in the orthopedic world, the tendon is more likely to fail you as you age. Commonly, Achilles tendinopathy develops between the ages of 30-50 years old. As the tendon ages, it loses its strength, stiffness, and ability to accept high loading forces. During this process of chronic degeneration another process occurs naturally in your body. As the tendon breaks down, your body naturally attempts to grow small vascular and nerve structures into the tendon. 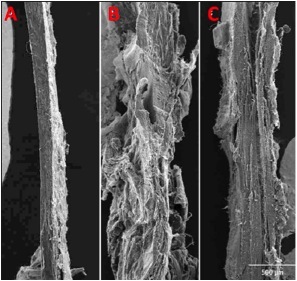 While it is not known for certain, one theory is that that these abnormal nerve outgrowths are the cause of chronic pain in the Achilles tendon. So what can we do to improve the nagging heel pain that prevents you from training for your next race or working a full day without irritation? SURPRISE…physical therapy is well documented in the literature to be a beneficial and successful treatment approach for managing Achilles’ tendinopathy. There are many different treatments to trial to address Achilles tendinopathy and each treatment plan will be different. Treatments may and should include some combination of strengthening, stretching, manual hands-on therapy, prescription of foot orthoses, electrical stimulation, core endurance training, or improving motor control in functional patterns. An analysis of running mechanics by a trained professional may guide appropriate treatments if your goal is to return to running pain free. An assessment of walking, stair climbing, squatting or other applicable daily movements will guide treatment for those looking to return everyday life without pain. 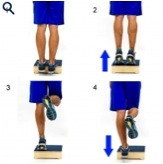 The most important and effective treatment that you can begin today is eccentric strengthening of your calf. The word eccentric means that you are strengthening a muscle as that muscle is elongating. For the Achilles, the best way to accomplish this is to rise up on the balls of both feet, then take the unaffected foot off the floor and SLOWLY lower back down to the ground with the painful foot. You should try to perform 10 repetitions for 2-3 sets. This exercise may cause some pain. This is normal! As I mentioned previously, your muscle has become poorly and inefficiently aligned resulting in chronic pain. The goal of this exercise is to realign the muscle fibers in your tendon so that they run parallel to one another without disruption from painful and abnormal outgrowths of nerve and vascular structures. Picture A shows a non-injured ligament. Picture B shows an injured ligament that did not receive instrument assisted soft tissue massage. Picture C shows an injured ligament that received instrument assisted soft tissue massage. It is fairly clear that Picture C most closely mimics a normal ligament and will more successfully resist forces that are applied to it. This treatment can be extremely beneficial for Achilles tendon dysfunction and should be considered as a treatment option if you have heel pain. If I’ve lost you in the details along the way, let me summarize the most important points. Heel pain can be a nagging and chronic issue that will be more prevalent without the appropriate preparation. The pain can be reduced or eliminated with the appropriate training techniques. Start strengthening your calf now by practicing your eccentric heel raises, before you hit the pavement for your spring training runs. If your pain is persisting or worsening, I encourage you to consult one of our highly trained physical therapists at Willow Grove – Hatboro Physical Therapy so that a plan can be developed immediately to squash your nagging heel pain. We are happy to help!